Portrayed in The Queen's Lover as mentor to Catherine de Valois, Christine de Pizan was quite a woman! She was the first woman in France, possibly in Europe, to earn her living as a writer. Born in Venice in 1365, her family moved to Paris when she was about five when her father, Tomasso de Pizzano, was appointed as court astrologer/physician to King Charles V of France (where the family name was changed to Pizan). Christine grew up in the royal court which at the time was renowned for its intellectual pursuits and for having the finest library in Western Europe. At age 15, she was happily married to Etienne du Castel, a young scholar and court secretary who encouraged her to continue her studies - but her idyllic life was not to last. By twenty-five she was widowed with three children, a niece and a widowed mother to support, and with no money to call on as her father's estate was locked up by legal wrangling for twelve years. Christine (who wrote in her adopted tongue of Middle French) had a significant influence on fifteenth-century poetry in Europe. Supported by important royal French and English patrons, perhaps in large part for her novelty value, she composed over three hundred ballads and many shorter poems over 20 years, many espousing the romantic exploits of her patrons. By 1402 she had begun to move out of the courtly circle and establish herself as a writer concerned with women in society. Her works included biography, poetry, history, novels, short stories, books on advice and morality, religion, politics, literary commentary and even military techniques (a partial list of her works can be seen here). During this time she started to challenge renowned male writers who incorporated misogynist beliefs within their works. She specifically objected to the use of vulgar terms in Jean de Meun's 13th century allegorical poem, Romance of the Rose, which she argued purposely slandered women. Many modern feminists date the beginning of the feminist movement to Christine de Pizan, but this has been challenged by some who say that her views were not progressive enough to be considered feminist, and thus designate her a 'proto-feminist'. Considering that de Pizan lived in a time when the punishment for heresy was to be burnt at the stake (like her contemporary Joan of Arc, about whom she wrote), it seems rather churlish to claim that she doesn't deserve to be called a feminist because her views weren't progressive enough by the standards of the last century or two! 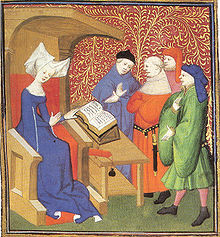 Image: Christine de Pizan (also known as de Pisan) lecturing to a group of men; artist unknown. Useful Link: "A Plantagenet Primer" in the sidebar to The Serpent's Tale. This "beyond the book article" relates to The Queen's Lover. It originally ran in May 2010 and has been updated for the March 2011 paperback edition.